One of VW boss Herbert Diess' big wins was hiring of former ZF CEO Stefan Sommer to lead procurement. 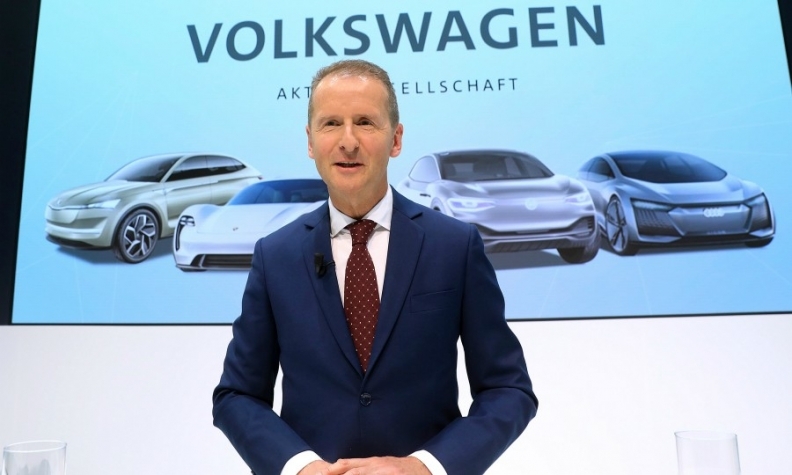 FRANKFURT -- Herbert Diess' initial efforts to slim down Volkswagen Group's sprawling empire have earned him praise as he surpasses his first 100 days as CEO this week, even as the automaker's core strategic direction remains unchanged. On April 13, the 59-year-old Austrian assumed responsibility for the group in a surprise boardroom reshuffle that ended former CEO Matthias Mueller's reign with roughly two years left on his contract. Diess, who joined VW in 2015 as VW brand chief, a job he still holds, promised VW Group investors he would to transform the company from a “cumbersome supertanker into a powerful fleet of speedboats.” By breaking down silos between the individual brands, VW as a whole could reduce a bloated and wasteful bureaucracy, he said. "Right now, processes in the Group are too complex and decision-making is too slow. In many cases, we are duplicating work," he told shareholders in Berlin just two weeks after taking over as CEO. He has placed smaller peripheral businesses including motorcycle brand Ducati, industrial transmission maker Renk and ship engine builder MAN Diesel & Turbo on strategic review for possible spinoffs or disposals. In addition, VW Group's Scania, MAN and Brazilian VW truck units are set for a partial stock market listing under the name Traton in a deal that VW's board estimates could reap proceeds of 6 billion euros. "What you notice is his aim to make Volkswagen more manageable by selling off non-core activities. He's started putting the group on a cleanse and diet," said NordLB analyst Frank Schwope. "Nevertheless these aren't necessarily his own ideas – some were decisions taken long before for which he will reap the rewards." Indeed, Diess has elected to retain the strategy set out in his predecessor's Together 2025 midterm plan and announced two years ago. "By and large, Diess is sticking to the direction set out by Mueller, which is good. And he brings speed, importantly," said Ferdinand Dudenhoeffer, director of the Center for Automotive Research at the University of Duisburg-Essen in Germany. Beyond the portfolio review initiated by Mueller, this includes a realignment of VW's in-house components operations, a push into mobility services with its Sedric autonomous vehicle and an ambitious goal of electrifying all 300 group models worldwide by the end of the next decade. "We can build on a solid foundation," Diess told reporters on his first day on the job. "This is an evolution, not a revolution." Despite record sales volume, revenue and operating profit in his final full year as CEO, Mueller was often considered an interim solution. Many had argued that Diess would have been the better choice when Mueller was chosen in 2015 to replace Martin Winterkorn who stepped down at the height of VW Group's emissions-cheating scandal. Diess, however, had only been at VW Group for a few months after arriving from BMW. When VW triggered speculation this year that Diess would replace Mueller, shares closed nearly 5 percent higher. Analysts and investors pinned their hopes on the veteran cost-cutter, believing only a true outsider such as Diess would be able to introduce professional standards of corporate governance to a company long known for its strong political and union influence. So far that hasn't been the case as the same supervisory board that appointed Diess immediately saddled him with a trade unionist as his new head of personnel. Gunnar Kilian served for years as the trusted lieutenant to VW's top labor leader, Bernd Osterloh. Kilian must now negotiate wage deals on behalf of Diess with his former boss. Since Diess has not been one to avoid conflict with VW's organized labor, he can count on the support of Ingo Speich. The fund manager and corporate governance expert at Germany's Union Investment expects the CEO will take a more forceful stance when it comes to pushing through unpopular, but necessary measures to safeguard the company's future. "One thing you definitely notice is the difference in communication between Diess and Mueller, both externally and internally. In particular toward the unions we welcome the greater stringency," Speich said. "The feeling in the past was that labor played a dominant role when it came to strategic decisions, sometimes too dominant." In particular he hopes Diess can convince unions of the need for changes to its production base as the company shifts the business from combustion engine-based cars to electric ones. Diess also won praise for enticing Stefan Sommer, the former transformative CEO of supplier ZF Group, to lead a combined portfolio including Group Components and Purchasing. "There is probably no one better in the entire supplier industry than Sommer. No one knows the business like he does and I am certain he will succeed," Dudenhoeffer said. “The only question that remains is who will run the VW brand? Although Diess certainly can do both, a natural distance between the group and the brand is important." Here Diess has fallen short on one key promise made by the board, however. To ensure VW wouldn't concentrate too much power in the hands of one manager, Chairman Hans Dieter Poetsch promised the VW brand would gain for the first time a chief operating officer to assist Diess. More than 100 days later nothing has happened. One German auto industry expert, who declined to be named in order to maintain good ties to the company, said many decisions thus far felt too cosmetic given the expectations placed in Diess. Pointing to the many similarities with Mueller's strategy, he said: "I'm not sure what it is he was hired for." Time will eventually tell if Diess may need to overhaul the group more thoroughly or he simply needs to increase the tempo on issues already tabled by Mueller's Together 2025 strategy.